For reasons of comfort, many people choose to buy electric bidet toilet seats. They are easier to use and have warm water and warm seats. But there are a good number of reasons why it would make sense to consider a non-electric seat. For starters, non-electric seats are substantially cheaper than electric ones. And since electric bidet seats require an electric outlet to use, some people face the added costs of installing one close to the toilet. Contrary to what most people think, it is possible to get warm water with a non-electric bidet seat. Depending on the model, you can usually do so by linking the seat to your sink. We would say that if your budget is small, and you just need something to wash with, then a non-electric bidet might be the right choice for you. Below, we listed some of the bestselling non-electric bidet toilet seat and attachments available today. GenieBidet Seat - Self Cleaning Dual Nozzles. Rear & Feminine Cleaning - No wiring required. Simple 20-45 minute installation or less. Hybrid T with ON/OFF Included! The Ellegantz GenieBidet seat is a great no-frills product. It features a simple and clean design. It is one of those bidets that can be attached to a hot water supply. The bidet has two spray jets that are operated by a lever on the side. Turning the lever one way will activate the rear wash, and turning the lever the other way will activate the front wash. As you can see, it is very easy to use and also quite comfortable. It’s also nice to have two spray jets so you have more options to clean more thoroughly. You can get the GenieBidet in both elongated and round shapes. This bidet will fit just about any toilet. Do read our review to get the exact dimensions of the product. While not a bidet seat, we wanted to include the Astor non-electric attachment because it turns your existing toilet seat into a pretty awesome bidet – for close to nothing! To install it, you just have to screw it into place underneath your existing seat and link it to your water supply. The bidet operates by a dial that’s located to the right of you when you sit down. You use the dial to turn the bidet on/off and to adjust the water pressure. The nozzle retracts when the bidet is turned off. The Astor bidet has good water pressure and it cleans well even on the “Low” setting. Not only is this a great product to invest in, it’s also a great starter bidet for those unsure about whether or not they would like to use a bidet. For a little under $30 it’s worth the try. Like the Astor, the BioBidet Simplet BB-70 is a bidet attachment. The design and installation are similar. The Simplet BB-70 operates by a dial too. The one difference is that the BioBidet comes with metal parts that might appeal to some for durability. The nozzle can also be removed if you want to clean it that way. Function wise, the BB-70 is very similar to the Astor. They both have good water pressure. Price wise, they are both under $30. We would say that the Astor edges out the BB-70 by a small margin, mainly because the product seems sturdier and it seems to clean better. We also have small concerns about the nozzle with the Simplet, because you can detach it and that might cause functionality problems, even though the flip side is that you can clean it easier by removing it. In any case, both bidets provide good function for value. The next non-electric seat attachment we want to take a look at is the Luxe Bidet Neo 180. This bidet attachment features dual nozzles. One for a rear wash and one for a front wash. Both nozzles are protected by a “guard gate” which covers them for the purpose of keeping things hygienic. There is also a cleaning feature that rinses the nozzles to clean them. The Neo 180 can only be connected to cold water. To turn on the water spray, you pull a lever, which some people find to be easier to use than a knob. To select the kind of spray, you turn a knob. So this bidet actually comes with both a knob and a lever. 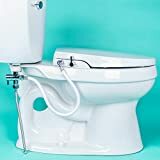 Price wise, it’s a little more expensive than the Astor and BioBidet Simplet BB-70, as it does have some extra parts and features like the nozzle rinse that we mentioned. Another fantastic non-electric bidet is the Neo 120 by Luxe. Unlike the Neo 180, the water of the Neo 120 bidet attachment is turned on using a knob. So if you prefer a knob over the lever on the Neo 180, then you can consider then Neo 120. For adults we think the lever is more comfortable to use, but if you have children, the knob is easier to learn. Because the knob positions are clearly defined, this makes it easy for someone to switch the knob to their desired position. Like the Neo 180, the Neo 120 has a guard to shield the nozzle and keep it clean. It has the same cleaning feature that rinses the nozzle too. But the Neo 120 only has one spray. In terms of price, the Neo 120 is comparable to the Astor, so it is much cheaper than the Neo 180. Basically, you are paying less for one less nozzle on the Neo 120. That’s it! Thanks for reading. We hope this list helps you choose a great non-electric bidet!